Keeping feet covered while living in a dorm room is a priority! How come? Well, even if your school did a good job vacuuming, plenty of students have most likely already lived in your dorm room before. And with such a small living space, it's easy for things to get messy and dirty. Hopefully your whole floor isn't as bad as those communal shower floors, but use precaution and add the right supplies for college to your dorm essentials list. Amid those college items should be some Dorm Snoozies - Neon Bright Orange. They're neither slippers not socks, but are comfy and warm foot coverings to keep feet happy. Good dorm products are usually supplies for college students that have more than one purpose. 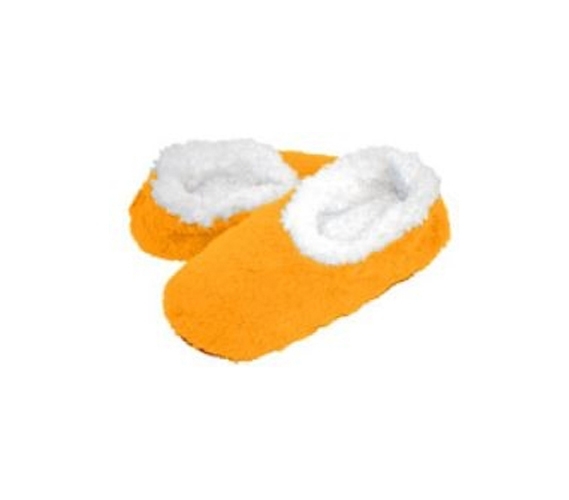 While these Snoozies might look like simple slipper foot coverings, since they can keep feet clean, warm, and comfy, their usefulness is tripled! But in all seriousness, you'll need the right college stuff to stay comfy in that little living space, and if your feet get cold, you're not comfy, plain and simple. Fortunately, our Snoozies are here to help, so pick your favorite color and add these cheap dorm items to your supplies.